A condensed version of this interview appears in the January/February issue. 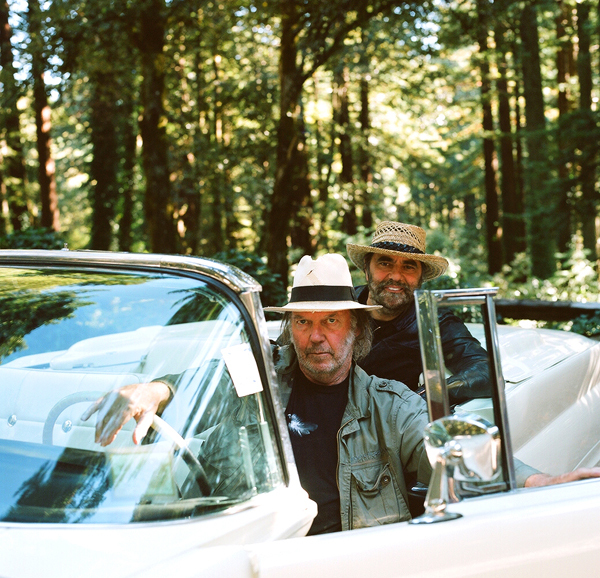 Serious, intense, with hooded blue-gray eyes that always seem capable of pinning you to the wall, Neil Young looks like a man who has forged an uneasy peace with himself and the choices that he’s made. Gone is much of that early restlessness and ire; the kind of discontent that found him pitching televisions out of third story windows into southern California canyons, or scowling onstage amid a 15-minute version of “Down By The River,” without ever acknowledging his audience. Two months from his 65th birthday, there is an air of quiet acceptance about him as he sits with perfect posture in his smart white Panama hat, trimmed beard and green military jacket. His lived-in features – chiseled and defined – give him the air of an aging leading man, and as you take a step back and squint, he resembles no one so much as Gregory Peck, with the same mixture of obsession and righteousness. Usually just as tough and stoic as the late actor, Young seems uncharacteristically forthcoming in this unassuming restaurant perched in a redwood grove on the side of a mountain near his rambling Broken Arrow Ranch, the 1,500 acre spread he purchased back in 1970 for the princely sum of $350,000, naming it after a Buffalo Springfield song. Perhaps the reason for the lightened mood has much to do with his new association with Daniel Lanois, who produced Young’s latest album Le Noise. What makes this new partnership propitious is that according to Young, Lanois is the first person who has told him the truth about his music, since the death of his former producer David Briggs in 1995. But not only that, Lanois was able to coax a whole new panorama of sounds out of the august artist, creating a work that pays homage to Young’s storied past, but also looks to the future by using an entirely new sonic palette and hallucinatory echoes without sacrificing his rough edges. If the truth be told, Le Noise is like a Crazy Horse record without Crazy Horse. And just as revelatory. Not only does Young divulge his creative process on the song “Love and War,” but he has allowed himself to mourn lost friends – specifically, L.A. Johnson and Ben Keith – in the simple eloquence of “I lost some people I was traveling with,” on “Walk With Me” – in a way that he hasn’t since the Ditch Trilogy and 1994’s Sleeps With Angels. Young talks to American Songwriter about what keeps him up at night, how he knows when it’s time to write, the spectral power of the moon and whether there is another ride for Crazy Horse. You’ve lived in the U.S. for so long, does working with Daniel Lanois make you feel more Canadian? I noticed that Toronto turns up in the lyrics of two of the songs on Le Noise. NY: I feel pretty Canadian. After you released Living With War, I thought you might consider running for office, and applying for American citizenship. NY: No, because I’m a Canadian. I’m born Canadian. You know, you can’t change some things. Nothing can change that. Like a piece of paper’s not going to change that. So I’m not going to get that piece of paper, because it won’t work. You can’t become something that you’re not just because it’s convenient. You haven’t had a producer in some time. Can you tell me about how it was to work with Daniel Lanois on Le Noise? What is he able to pull out of you?